Waiting for the Customer Call Back | A blog about smart POS software for independent small businesses. Like any software Help Desk, our Point of Sale software Help Desk sometimes sees calls bank up where we are waiting for a client to call back with more information. Where other software companies may close these calls, we place them in a waiting area of our CRM system. This waiting area is specifically for calls where we are waiting on our client to get back to us with some information, data or something else necessary for us to move forward on their service request. Our Help Desk team follows up waiting calls, where we are waiting for a client to get back to us, several times. If after three follow-up calls we make no progress on getting additional information, we let the client know that we are closing the call – but keeping details of the original call on their file for future reference. This process of managing waiting calls ensures that we give our clients time to provide the additional information sought so that we can provide the assistance necessary to addressing the original issue. It also demonstrates that we take our commitment to professional customer service seriously. It all sounds a bit boring talking about Help Desk call management in this way. However, we figured that it might be useful to explain how we do handle calls where we need additional information before we can help further. We are proud of our structured process and that the result is a better outcome for our clients. We see our Help Desk as our front line, the part of our company which most directly impacts on customer perception and, though this, our business performance. Following a round of consultations with Bike Shop owners and managers using our Bike Shop software, we have developed a series of enhancements which will further enhance our position as the most widely used bike shop specific software in Australia and the wider Pacific Rim region. Following assessment of the enhancements to be considered, we analysed and costed the changes so that decisions could be made about the commercial benefit and value. Work by our Software Development Team has commenced on some of the agreed enhancements and will be delivered in the next release of our software which is slated for release in June this year. We proactively sought the consultation opportunities with Bike Retailers as part of our 2011 commitment to take our software to new places of productivity and benefits for our customers. With an good size customer base already in New Zealand, we have a good pool of existing customers on which to draw as reference sites for sales prospects. Bookings can be made at our online training portal. You can quickly book and update your Outlook calendar from here. Access to the workshops is 100% free for owners and employees of retail businesses using our software. Retailers using our Point of Sale software are able to undertake stock takes using a variety of facilities including laptop, PDE (using our Retailer Mobile software) and other devices. Our software accepts stock take data files in a CSV format. 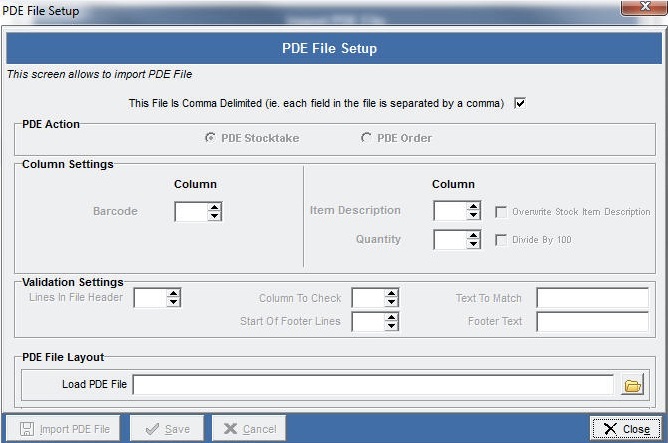 Customers can setup their system to receive this using the PDE File Setup screen shown here. This delivers flexibility and often enables customers switching from other software to use hardware from that software. We recommend that retailers undertake a rolling approach to stock takes. This makes efficient use of down time on the shop floor and provides a regular indication of inventory theft challenges. This and other stock take advice is covered in our training videos on this topic. 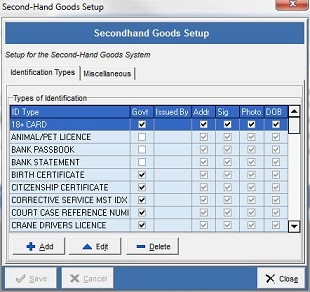 The PDE File Setup and stock take options are available in the latest release of our Point of Sale software. Watch for free online stock take training workshops in the lead up to the end of the financial year. Cosmopolitan and Australian House and Garden will be delivered tomorrow however the physical invoice and EDI file will be dated 1st May. Once you have received this invoice through Invoice Arrivals your subagents will be automatically allocated orders dated on the 1/5 or 2/5 depending systems settings). However you may wish to deliver this stock to all or selected Subagents on Friday/Saturday. To do this you will need to change the date of the order in the Subagent Order Screen. Once in this screen go to the All Subagents Tab and enter the PLU for the title you wish to change. You will need to change the week ending date for the for the week that includes the 1st May. This will then display the titles and change the dates on the orders for each subagent to your desired delivery date. Most agents (All VIC, NSW, SE QLD, Metro WA) will receive their entire Monday Deliver on Sunday in order to capitalise on the Royal Wedding. This should not cause you any concerns the only thing to remember is when asked “If you want to change the Delivery Day” that you answer YES. This will ensure the Customer and Suborders are changed and dockets and runlists are correct. We have provided this advice after discussing the one-off delivery changes with Network Services. Jewellers considering our Jeweller Software at the Autumn Jewellery Fair in Melbourne at the Royal Exhibition Building this coming weekend will have access to a very special offer. This trade show only offer is our way of thanking Jewellers for taking the time to visit the fair and to consider our Jeweller software. We are excited to be heading into our fourth trade show for the year with the first three events already generating good business for us. The most recent trade show, in New Zealand, connected with jewellers and other retailers in that marketplace. On our trade show stand in Melbourne this Saturday and Sunday we will have our Jeweller Software on show as well as information about our services available to help Jewellers get the most from our software. We have enhanced our personalised gift card offer for retailers using our Point of Sale software by now including gift card holders, key tag cards and protected finishes to the range. This is in additional to personalised bar codes, signature panels and other features available through our gift card offer. The new features are covered on the new gift card order form available from our website or through the company. 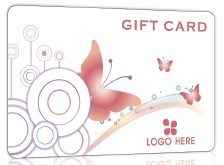 Through our marketing department we offer a custom gift card offer as well as access to a range of off-the-shelf creative designs which can incorporate business names and logos. The example here shows where a business logo can be included in our off-the-shelf card artwork. The flexibility in the Tower Systems gift card range enables our customers to spend according to their particular needs and budget. We are thrilled to have finalised the appointment of a new Web Developer to join our software development team. Enhancing our skill set and setting us up for developments in our web presence, this role is important to our business plans for 2011/12. One area of particular value from this roll will be the expanding connection between our Point of Sale software and e-commerce solutions used by retailers to run their online stores. How Much Does the Virus Threat Cost Business? The cost of the threat of damage by a computer attack is extraordinary, particularly at the small business end of the marketplace. Down here at the small business end of the software marketplace we often encounter people using firewall and other protection software without thought and often impacting on the efficient and hassle-free use of their core business software. More and more calls to our Point of Sale software Help Desk are to do with issues caused by ill-considered firewall and security software settings. We try and mitigate the cost by recommending the software our customers should use and the settings they should adopt. It is when they stray from this advice that they often end up with trouble and need our assistance. In these situations, the mates or others who advised their use of the software selected are often unable to help resolve issues their advice has caused. Navigating firewall settings for software we have little or no experience with can be time consuming. It takes us away from helping those who do follow our advice. We estimate that 20% of our total Help Desk time investment is on security threat related calls and that half of these could be avoided by following our advice from the outset. For virus and firewall protection we recommend using the advice contained in our firewall and virus advice sheet. In the meantime, those who create the threats must love this waste of time and consumption of business capital. We are back to full strength today after an extra long Easter break. While our after hours numbers have been providing support access for urgent issues, today is our first day back with full Help Desk coverage. While some of us are here already preparing for the day, our Help Desk opens shortly, at 7am. This will run through to 6pm when our after-hours numbers kick in. We have ensured that the Help Desk is resourced to cope with the usual post-holiday surge in call traffic. As we covered here last week, we have a structured software support escalation process to ensure that our customers are able to have their concerns dealt with at the most appropriate level in the company. Have sales assistants make up-sell offers thanks to promoting which can be set to appear on the screen during the processing of a sale. Promote Mother’s Day opportunities using ads / coupons / offers on receipts. Promoting Mother’s Day with text on customer accounts / statements. Advertising Mother’s Day offers on the LCD customer display screen – while displaying details of the sale being processed at the same time. Sending out promotional emails using the list harvested with our marketing tools. Sending out promotional text messages using the list harvested with our marketing tools. These are just some of the ways smart retailers are using our software to promote Mother’s Day offers in their store. There is no doubt about the value of leveraging existing customer traffic to spend more. PS. Mother’s Day is May 8 this year for those who do not keep track of such things. We are hosting two free online training workshops on two key aspects of our Point of Sale software this week, on Thursday. Both cover popular, high value, topics. Retail Stock Management – Reordering. Thursday @ 11am. Importing Stock Files & Invoices. Thursday @ 2pm. These are a must for anyone serious about getting the most from their Point of Sale software. We currently have fourteen places available in each. By learning online you get to access high quality training at home or work. You save on travel time. We find your access including the phone call for voice participation. The visuals are on your computer screen. If you miss the sessions on Thursday, they will be repeated next month. Bookings can be made at our online training portal. Newsagents using our newsagency software have been able to deal with public holiday and bumper edition delivery changes this Easter thanks to our smart handling of such challenges through the course of the year. By using our software to handle billing and delivery changes brought on by public holiday and other similar changes, newsagents are able to focus their attention elsewhere within their businesses. This is what good software does … takes care of time consuming and repetitive tasks so that business expertise can be better used elsewhere within the business. With more than 1700 newsagents as customers, we have a big pool of businesses to serve – distribution only, retail only, distribution and retail, payment point only, country town, capital city CBD – ranging from as few as 10 home delivery customers to thousands and from one sub agent to 180 sub agents. Our diverse newsagent customer base keeps us focused on delivering best of breed newsagency software. This is part of what drives our excellent market share position. We are thrilled to have helped newsagents handle delivery challenges this Easter and Anzac Day. We are resting our usual in-office Saturday Help Desk service today because of the long Easter break. Our usual After Hours numbers are operating for urgent assistance. Next weekend we will be exhibiting the latest release of our Jeweller Software at the Autumn Jewellery Fair in Melbourne at the Royal Exhibition Building – stand B85. In addition to showcasing our latest Jeweller Software which was released in March this year, our stand will also feature the Apple iPad, our new professional LCD customer display, the new HP point of sale terminal as well as a range of other innovations available for jewellers. Jewellers will be able to see our Jeweller software and easily draw comparisons with other programs also on show at the fair. Our software will be loaded and live with Jeweller data to enable full use of the software and to see the rich features we have available. Customer loyalty management and marketing. Pandora and other supplier electronic invoicing. Commission reporting for sales staff. Jeweller specific barcode label options. All of these facilities and more will be on show at our stand, B85, at the trade show at the Royal Exhibition Building. At 11am today we are running another free online training workshop covering the latest release of our Point of Sale software. Any of our customers wanting to access this free user training session should click here to book. During the Easter season this year, our Gift Shop Software has been helping retailers increase sales in a range of ways. Thanks to smart business building tools, gift shops using our Point of Sale software have been able to use the software to drive up-sell promotions, reward loyal customers, track laybys, manage accounts, process the increase in sales without increasing labour cost, track customer purchases for later analysis, compare this year to last year, track fast sellers (and slow sellers), manage catalogue offers, turn customer receipts into marketing tools, use the customer display to promote complimentary products and easily compare business performance to this Easter to last Easter. The real benefit of our Point of Sale software comes immediately after Easter is over. This is when gift shop owners can analyse the performance of the season in full and plan for 2012. We gladly help our customers with this analysis. 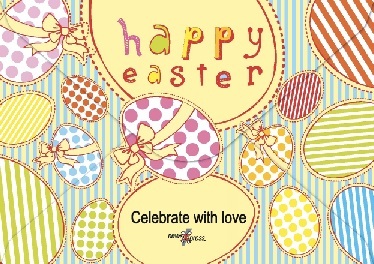 Early indications are that Easter 2011 has been a strong retail season for gift shops. Mark Fletcher, our Managing Director, has just been interviewed for a feature being written about innovation in retail and, in particular, how the smart decisions some independent retailers are making using Point of Sale software. We are thrilled to share stories of genuine innovation by retailers. We have businesses in our customer community which have gone from loss making to profitability, others which have switched product niches with tremendous success, others which have cut floor stock by 33% while increasing sales and others who have cut 25% from their employment roster without losing a beat in revenue. How far retailers go with the retail management technology we sell is up to them. Our role is to facilitate innovation, show pathways available and to encourage, guide and promote genuine innovation. We want our customers and their retail businesses to be the heroes. This happens when they engage and push our software as far as it can go. The recent interview covered some of these topics … hopefully, it will encourage others to engage. Our software enables the retailer to tailor the software to suit their specific needs. This is done through easy to follow setup processes. We offer training as well as post installation support on this. The latest release of our software delivers enhancements in this growing area of second-hand goods – thanks to helpful feedback from retailers operating in this space. Their feedback has resulted in software enhancements and business understanding which are now helping some of our existing Point of Sale software customers to consider making the move into this retail niche. We will be closing our offices from 6pm on Thursday April 21 and reopening at 7am on Wednesday April 27. This covers all gazetted public holidays over the Easter period. Our After Hours and Emergency numbers will operate through the entire time. Given the length of this holiday period, we will be paying particular care over the next few days to ensure that we go into the break with no backlog of queries. Software users can be quick to criticise the support they receive from the help desk of their software provider. Whether it is perceived rudeness in the call, slow service or poor advice, the experience can make them unhappy, often more unhappy than the actual experience can warrant. To demonstrate our commitment to genuinely good, consistent and timely customer service, years ago here at Tower Systems we established an escalation process for retailers using out Point of Sale software. Here is the escalation process which is open to all of our customers. Help Desk. This is the entry point for every query and support call relating to our software. We have a large team of IT professionals staffing our help desk and providing advice and support. All calls a logged and tracked using a sophisticated Customer Relationship Management system. We operate to a target service level and track this regularly to measure our own performance. Customer Service Manager. If any of our customers feels let down by contact with our help desk, the next point of escalation by the customer is our Customer Service Manager. Simon Frost holds this role within the company. He will review all information about a call and look at the questions or issues from a different level than traditional help desk contact. Simon is contacted through our usual help desk number of my email on simonf@towersystems.com.au. General Manager. If a customer feels let down by contact with our Customer Service Manager, they can escalate the issue to Gavin Williams, our General Manager. Gavin will take on details of the complaint and then complete a thorough investigation before coming back with a considered response. Gavin can be contacted through our head Office number on 03 9524 8000 or by email on gavinw@towersystems.com.au. Managing Director. If a customer remains unhappy after using the previous two escalation points, they can make direct contact with Mark Fletcher, the owner and Managing Director of Tower Systems. Mark will want as many facts so that he can properly investigate the issue through the company’s internal systems. Mark can be contacted any time on 0418 321 338 or by email on mark@towersystems.com.au. This customer service escalation process is documented regularly in emails and newsletters to customers, to ensure that our customers know the various channels they can use to escalate issues of concern to the right people within Tower Systems. We are serious about providing timely, professional and friendly customer service as we understand that to many customers we are only as good as our last support call. Good customer service is a key reason we win business. Customers talking to colleagues about good service generates sales leads … we like that. These are available from the downloads section of our website. Smart retailers in today’s economic climate want to remove as many barriers as possible between an opportunity and a sale. This is why we have seen a rise in the use of LayBy as well as store credit and other payment mechanisms in a variety of retail situations over the last year. Retailers who want the business sometimes need to provide funding. While this approach has been common in big box and furniture situations, it has been less common in marketplaces in which we serve: jewellers, bike retailers, gift shops, homewares stores and newsagents … until recently. Here at Tower Systems we are watching changes in the use of credit in retail situations. We are committed to ensuring that our software maintains relevant and useful facilities which enable our retail partners of ensure that barriers between opportunities and sales are kept at a minimum as far as our Point of sale software is concerned. These can be accessed from the downloads section of our website.